There’s a new sweet shop in Champaign, and it lives at 2005 S. Neil Street. 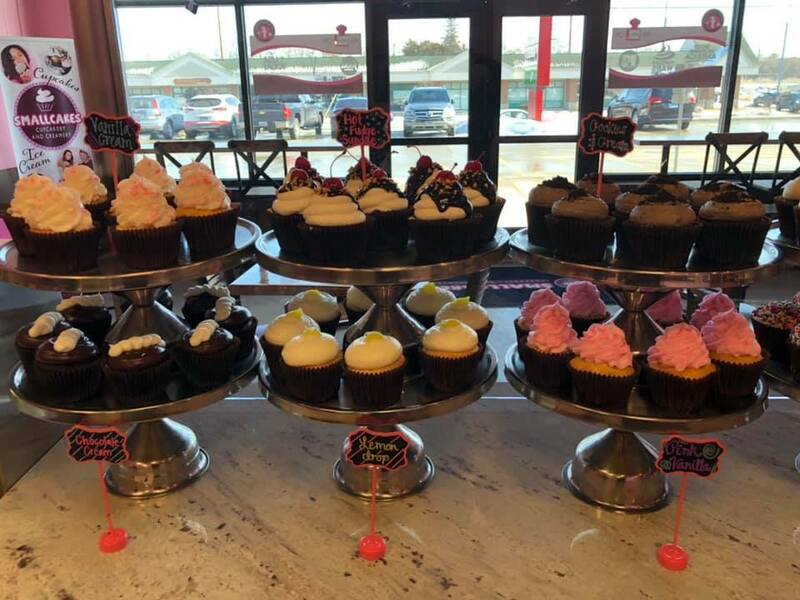 This pink and brown sugary store touts two things I know well: cupcakes and ice cream. Smallcakes Cupcakery and Creamery is in Champaign’s Carriage Center, home to Checkered Moon, Harvest Market and Slim Chickens, to name a few. We visited the local franchise before the menu was even posted. However, they were not short on cupcakes. Glass towers displayed beautiful confections. Helpful staff encouraged us to buy a half-dozen cupcakes. Buying bigger quantities yields a better price. They are $3.75 each, six for $20 or a dozen for $38. So, a little pricey. I didn’t mind, though, as the quality met the cost. They have consistent flavors. These are mixed in with some seasonal ones, like holiday cake. When we were there, I saw birthday cake, caramel crunch, carrot cake, choco-holic, hot fudge sundae, lemon drop, peanut butter cup, pink vanilla, red velvet, vanilla cream and wedding cake. First, they were perfect-looking. They almost looked like they were toy food. We bought birthday cake, caramel crunch (topped with salty pretzels), choco-holic, chocolate cream (like a Hostess cupcake), lemon drop (filled with lemony goodness) and peanut butter cup (topped with crumbled candy). Some are filled and frosted, while some are just frosted. Generously. There were no complaints from our family. Every single one was delicious. All fresh, all moist. The buttercream frosting was not too rich or gritty with sugar. It also doesn’t taste like a stick of soft butter. It’s lighter than that. They also make ice cream in-house. At any given time, there are six to 10 flavors for sale. As they run out, they rotate flavors in. You might find cookies and cream (with cream cheese frosting running through it), red velvet (with pieces of the cupcake in it) and vanilla bean. The consistency is a cross of soft and hard serve. Get a scoop of ice cream for $3.50, or you can get two scoops for $6. If you have a special occasion, or your kid pulled in straight As, celebrate with a smash cake. This gluttonous delight is made right in front of you. Just choose a cupcake and ice cream flavor. They take the two and layer them with whipped cream. You can also add hot fudge, sprinkles and lots of other deliciousness. It comes in a cup for $8.50, or you can get an adorable take-home mason jar for $10. These will feed more than one, by the way. Probably a small family. Or me and my husband. OK, OK. There’s more. Get a shake. Made with cake and ice cream. Choose your cupcake flavor. Choose your ice cream flavor. They take these two beauties, and they blend them to create a perfect marriage. These are $8.50. When you visit, get a punch card. After a dozen visits, you get a free cupcake! Look for more traditional cakes, too. WANT MORE INFO ON CHAMPAIGN-URBANA CUPCAKES? See our readers’ favorites, from 2017.